The AS440 is a half-wave phase-controlled thyristor type Automatic Voltage Regulator (AVR) and forms part of the excitation system for a brushless generator. In addition to regulating the generator voltage, the AVR circuitry includes underspeed and sensing loss protection to ensure safe, reliable control of the generator. 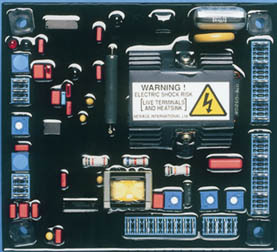 Excitation power is derived directly from the generator terminals.